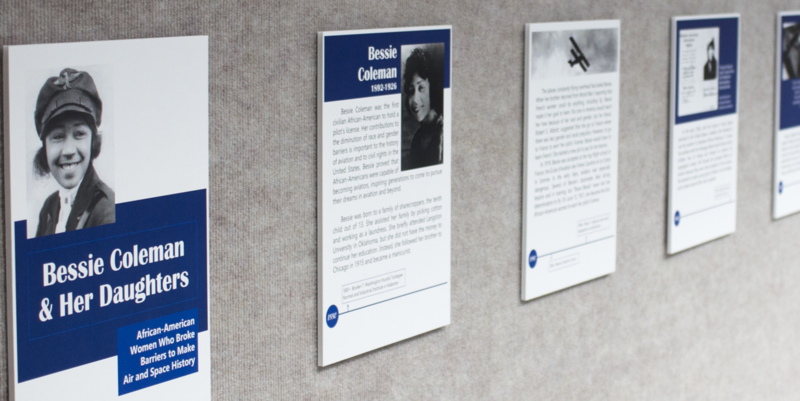 The International Women’s Air & Space Museum offers traveling exhibits to libraries, schools and other organizations interested in highlighting women in aviation and aerospace. Exhibits generally contain 20-40 panels, which include photographs, reproduced documents, and label copy for use in your display. Exhibits must be requested at least four weeks in advance. Rentals are first come, first serve. Exhibits should be in a protected environment – behind glass or in the view of organization personnel. They may be displayed on shelving, or by utilizing Velcro or Command Strips. Museum brochures must be made available for patrons throughout the time the exhibit is on display. 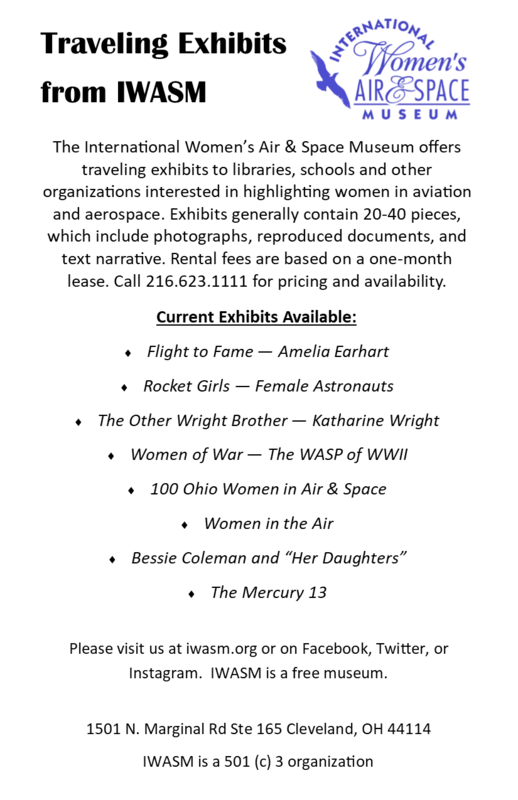 Label copy stating that the exhibit is courtesy of the International Women’s Air & Space Museum must be displayed. Any exhibit piece that is destroyed or missing must be replaced. Exhibits must be returned to the museum in a timely manner or additional charges may apply. Exhibits are returned at your organization's expense. There is a $75 fee for rental - based on a 4-week time slot. 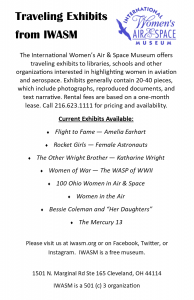 The 100 Ohio Women exhibit is pick-up only. Rental fees are based on a one-month lease. Call for pricing for additional loan time. If you have any questions or concerns about any of the Temporary Traveling Exhibits listed, or if you would like more information, please contact us at 216.623.1111 or email Heather Alexander at halexander@iwasm.org.